Selected articles and columns published in various media by Katharine Fletcher. Being hardy Canadians we concurred. After all, December to February is summertime in the southern hemisphere, where we enjoyed “balmy” temperatures of +5C to -5C. Nonetheless, the trip is an “expedition” because in Antarctica, ice rules. 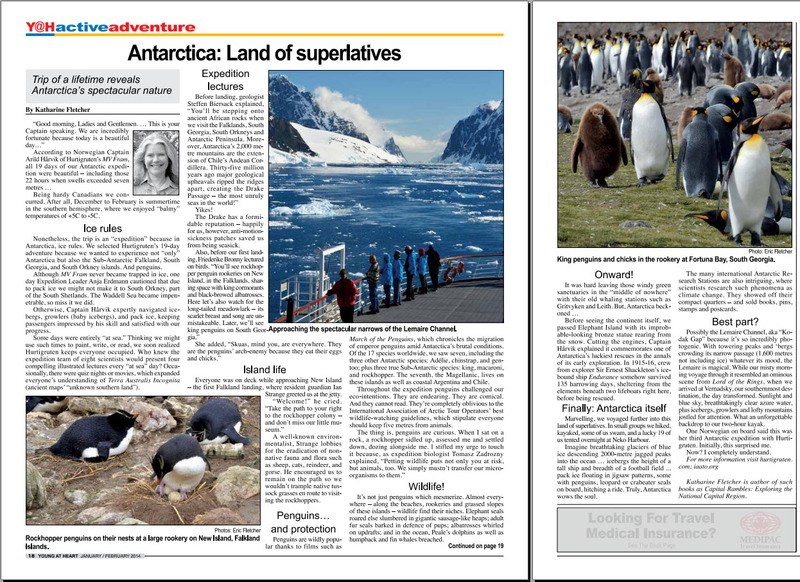 We selected Hurtigruten’s 19-day adventure because we wanted to experience not “only” Antarctica but also the Sub-Antarctic Falkland, South Georgia, and South Orkney islands. And penguins. Published in Ottawa’s Young@Heart newspaper, January/February issue, 2014. Click the thumbnail to read a PDF version of the full article. Visit my website, my personal blog (Notes from Spiritwood), or follow me on Facebook, LinkedIn, and Twitter.